I often receive questions about our altar arrangement. Why do we place an altar crucifix at the centre of the altar, which seems to impede visibility, that is I lose eye contact with the congregation? The question suggests that the crucifix is an obstacle which blocks the view of the priest as well as the congregation. 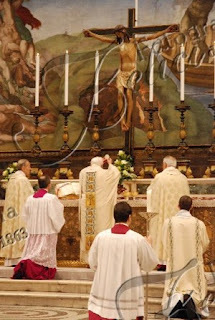 In the old form of the Latin Mass, the crucifix could never be described as an obstacle since both priest and congregation would be turning towards it during the mass, the whole congregation would be facing “East”, Ad Orientem, or to be more accurate, Ad Deum, “Facing God”, as it were. But with building of free standing altars and turning of priests to their congregation, it would seem that though people still had a view of the cross, the priest’s vision of it was impeded, with his back turned to it. Furthermore, the priest now stood out as the main performer of the mass, and even sometimes a distraction from the truth that the mass is the Sacrifice of Cross. It was here that the eminent theologian and Pope, Benedict XVI, proposed the solution of the cross on the altar, “Where a direct common turning toward the east is not possible, the cross can serve as the interior ‘east’ of faith. It should stand in the middle of the altar and be the common point of focus for both priest and praying community.” Therefore to the objection that the cross is an obstacle is ludicrous. The cross does not impede our vision, in fact, it helps us to see. It opens it up an entirely vast and new horizon. It is the lens which allows us to see beyond the seemingly human rituals of the mass, to that great sacrifice that took place on Calvary, that great Paschal event of humanity’s redemption. In today’s Office of Readings, the Liturgy of the Hours shares with us the beautiful spiritual reading taken from the discourse of St Andrew of Crete. It explains beyond any doubt, why the cross can never be an obstacle. “We are celebrating the feast of the cross which drove away darkness and brought in the light. As we keep this feast, we are lifted up with the crucified Christ, leaving behind us earth and sin so that we may gain the things above. So great and outstanding a possession is the cross that he who wins it has won a treasure. Rightly could I call this treasure the fairest of all fair things and the costliest, in fact as well as in name, for on it and through it and for its sake the riches of salvation that had been lost were restored to us. For these reasons, the Cross can never be an obstacle. To the Romans, it may have been an instrument of torture or execution, to Constantine it may have been an amulet of power, to the Persians a trophy of conquest, but to us Christians, it is the very symbol of Christ’s victory over darkness, death, sin and the devil. Therefore, as the entrance antiphon exhorts us, “We should glory in the cross of Our Lord Jesus Christ, in whom is our salvation, life and resurrection, through whom we are saved and delivered.